Are you Tech N9ne’s number one fan? Then prove it! Tech N9ne and Monster Energy have teamed up again for the Ultimate Fan Challenge: a competition that lets you prove that you’re the biggest Tech N9ne fan and gives you the chance to win your own personalized, RIAA-certified “Caribou Lou” gold plaque. 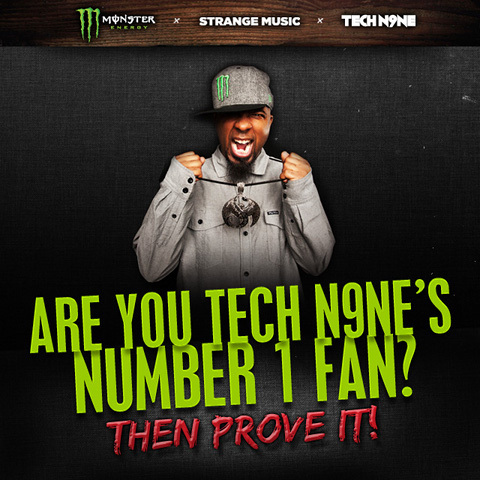 In order to be considered Tech N9ne’s #1 fan, upload a photo showcasing what makes you Tech N9ne’s #1 fan to Monster Energy’s Music Facebook page. Click here to go to the Ultimate Fan Challenge App and enter your photo for a chance to win your plaque!